As dentists we are exposed to patients from all walks of life. In the last few months of third year, we went through the paediatric (children) block of our dental studies. In this block, we learnt about how to communicate with and manage babies, toddlers and their families. 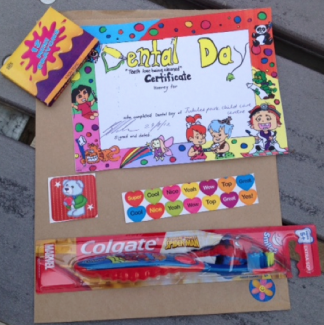 In the final week, groups of third year dental students went to visit kindergartens around Sydney. Our aim was to use our new found wisdom, especially with diet and cleaning teeth, to reach out to children and introduce us as ‘people who help you make your teeth happy’. We brought in gowns, dental goggles, plastic mirrors, gloves and masks, then played dress ups with the kids! Other activities included, sing-a-long with a guitar, puppet story telling, colour in dental models, and identifying ‘often’ and ‘sometimes’ foods! Whilst it was chaotic day there was lot of laughter and many memories made! We were surprised by how much the kids already knew and how keen they were to get hands-on learning experiences from the activities we had prepared. We look forward to our final year of dental school where we will begin to have paediatric patients!